We welcome international students who want to study anthropology in Belarus at state universities. WHERE TO STUDY ANTHROPOLOGY IN BELARUS? 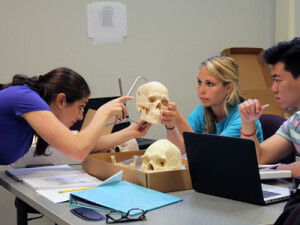 Anthropology in Belarus is taught at state universities with high attention and by highly professional teaching staff. Degree in anthropology from Belarus is recognized all over the world due to high quality education in Belarus with international standards. Many foreign students come to study anthropology in Belarus at different state universities and from different countries. Belarus welcome every year many foreign students for anthropology course and for 2019-2020 intake also receiving applications. Secondary school certificate is required for admission into universities in Belarus for undergraduate level. Foreign students give preference Belarus over other European countries due to affordable fee and cheaper living conditions in a very friendly atmosphere. Anthropology course in Belarus is taught on bachelor and masters level. Bachelor degree consists of 4 years at national university in Belarus while masters course duration is 2 years. International students first year study at preparatory faculty in Belarus at national university for 10 Months after completion this Russian language course for 10 Months they start their undergraduate degree program in Belarus. Process is quite simple.All foreign applicants must scan their secondary school certificate copy with travel passport copy in the Email mentioned below. Once admission office receive the required documents for admission,They assess the admission eligibility within 2 days and the applicants are informed by Email for their eligibility or ineligibility. Eligible applicants send the processing charges through bank and scan the admission fee receipt to the Email of admission office.Once admission staff receive the processing fee receipt,Their documents are forwarded for the processing of official study invitation to federal migration department. Processing period for the issuance of official study invitation is two weeks at federal migration department in Belarus. Ineligible applicants are required to scan more supporting documents for their admission process completion. Masters degree applicants scan their bachelor degree too for eligibility assessment. Belarus offer the easiest visa process for international students among all European countries. Most of the countries nationals depart with their official study invitation and OK TO BOARD for departure from country airport and visa is stamped at Minsk international airport for 125$.An insurance fee of 170 Euro is also to be paid at immigration counter at Minsk international airport. Few countries nationals still require visa before arrival because Belarus Embassy is situated in those countries for the issuance of visas.These countries are Nigeria,India,Pakistan,United Arab Emirates,Egypt and all European countries inclusive USA and Canada. Once the visa is issued applicants scan us the visa and ticket copy for the preparation of reception documents for immigration at Minsk international airport. Those foreign students who are issued visa upon arrival must scan us their air ticket 3 days before departure as same reception documents are required for them at immigration counter by us for their safe arrival and entry. Interested foreign students who want to study their anthropology course for 2019-2020 intake in Belarus may contact us freely anytime through the following contact details.